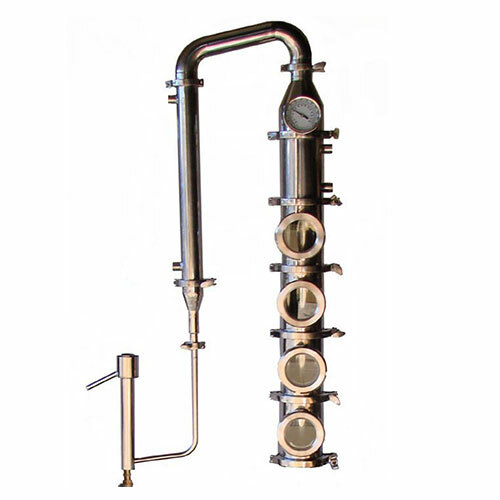 Stainless 4 Inch Diameter Mile Hi Flute professional distillery tower with a 4″ diameter stainless column and 3″ Sight glass allows you to see all the action. This column includes 6 stainless sections with copper perforated plates and down comers. 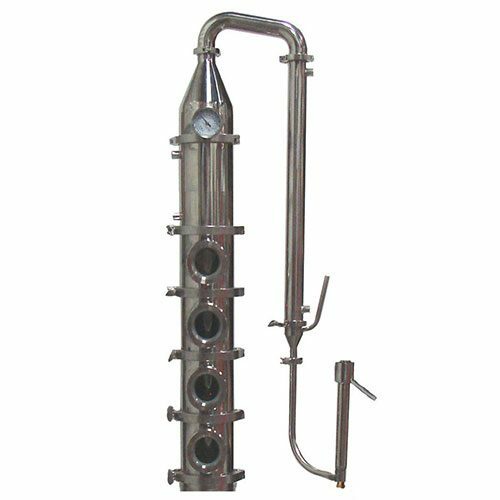 This completely modular still allows you to run 1,2,5,10 sections to give you as much or as little reflux as you desire. Complete with shotgun condenser and dephlegmator. With the built in parrot, you can see the percentage of alcohol real time throughout the run. 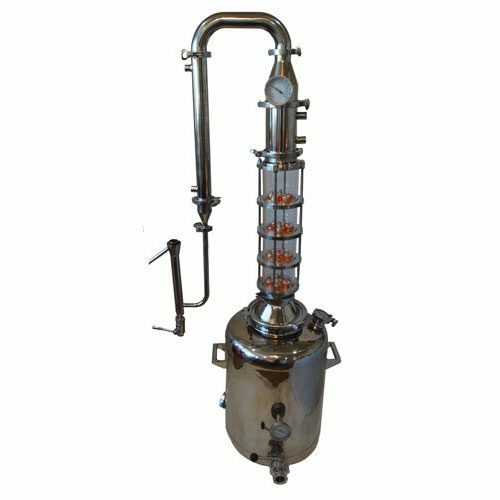 This modular design of this professional distillery tower allows you to add in a column extension with copper packing and raschig rings to get more reflux or add a sight glass with screened gasket to be used as a gin basket or infusion chamber to infuse the vapor with flavor. Even though I’m a novice Distiller, I was determined to own the very best I could get. I decided on the Mile Hi Flute. My Brother & I did a vinegar & water run to clean & cheack for leaks. (Flute was VERY CLEAN as delivered. But it’s safer to run vinegar/water to check for leaks.) Once this was done, we emptied the boiler/keg and did a 50/50, vodka/water run. WOW! I’m a novice but this piece of equipment runs very well! Almost runs itself. 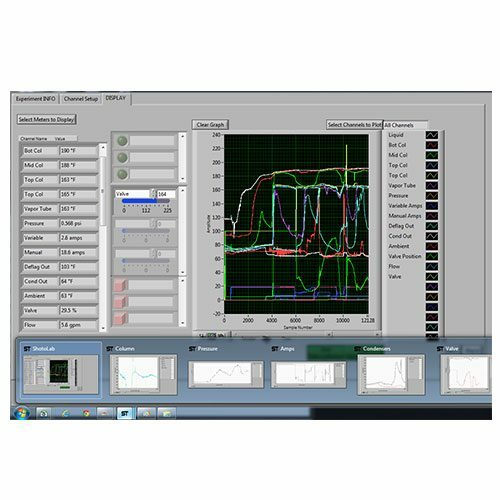 Very easy & intuitive to run. We put 2 gallons of watered down cheap vodka in at 20% strength. We did the run and in 40 minutes got almost a half gallon of 80% out of it. Nice. And that cheap vodka came out smoother at 160 proof than the original 80 proof. ( it IS obviously stronger & “warmer” of course, but smooth) We can’t wait to run an actual sugar wash. I don’t expect any problems. I DO expect my skills to improve as I learn to get the most out this excellent piece of equipment. THANKS, to Mile HI & to Mike for his personal customer service! Wow. The quality of this flute is incredible. Built like a tank. I was worried that it may be to heavey for my keg boiler, but no problems at all. My first run came in at 65% abv and the second run was 76% abv. Not sure what % the beer started out at, but impressive for the first runs with no adjustment of the dephlegmator. I will say the packaged was damaged by the shipper, but only a few scratches so I did not report it to Mile Hi. Got my Mile High Flute, as I emptied the box I was so impressed with the quality and fine craftsmanship of the product. Truly a piece of equipment that will last a lifetime and beyond, I would go as far as to call it a work of art. There was an issue with my order, a single e-mail and the Mile High guys were on it, a phone call from the service manager and the problem was taken care of swiftly and professionally without question or delay. You guys have earned a customer for life. I received my Flute today. I pulled everything out of the box and put it together. This is an amazing product. 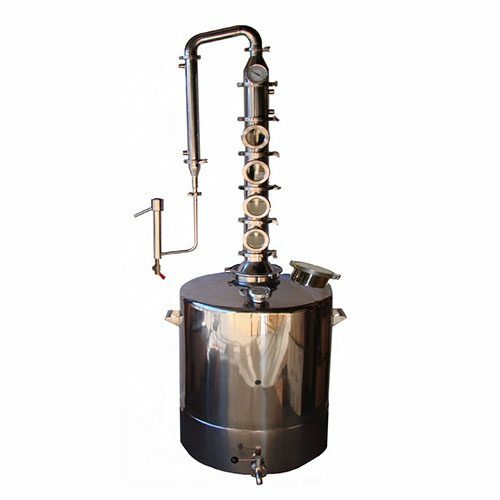 It will look beautiful in my distillery. Wonderfully Handcrafted. If your looking a nice piece of equipment this is the one. I just unpacked my stainless steel flute and all I can say is WOW. This is a very nice piece of serious equipment. The pictures do no justice with this flute. Thanks for producing such a nice piece of equipment. This is the Greatest Thing since Sliced Bread! My first run was a 25 gallon sugar wash with Prestige Black Label Yeast,2 Gallons of 194 Proof!!!! Unbelievable! Second Run of the same, another 2 Gallons of 194 proof. Wow, Thank You Mile High.